When your baby first comes home from the hospital, it’s likely you’ll want them to sleep close to you. One of the best ways to do that is using a bassinet right next to your bed so you can always keep an eye on your little one while still giving them their own space. For this baby bassinet review, we looked at some of the most popular and best-selling products. First, let’s look at some of the features you should know. Mattress: All but one of our picks includes a mattress or mattress pad. They’re all pretty thin. You don’t want the baby raised up too high so they’re close to the top of the sides. That said, they’re still comfortable nonetheless. Speeds: A lot of the best products we found are manual, which means you have to do the rocking yourself. But some of the battery powered ones are pretty awesome, one of them even has 6 different rocking speeds to choose from. 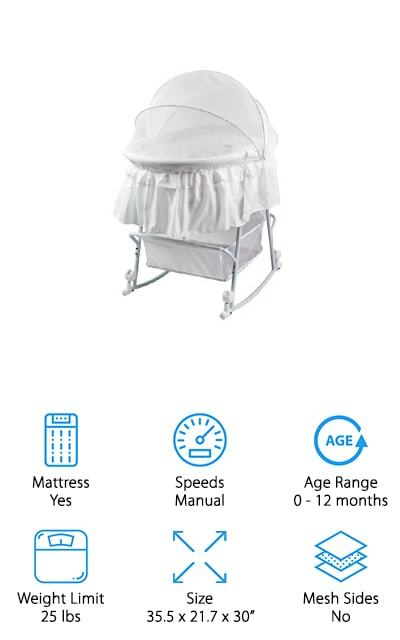 Age Range: All of these bassinets are meant for newborns, the thing to worry about is when they have to stop using them. Generally, this is when they reach the weight limit or can sit up or pull themselves to standing. Weight Limit: Weight limits vary a lot with these products, ranging anywhere from 15 to 40 pounds, believe it or not. There are a lot of different designs here, some of them you can use through your baby’s first birthday. Size: This is the size of the bassinet when it’s open and tells you how much floor space it takes up. That’s not all, some of these fold up very compactly, perfect for travel or to put in storage. Mesh Sides: If you want to be able to easily keep an eye on your baby from across the room or without having to disturb them, mesh sides are great. They let you see in and keep air flowing through. Now that you know a little more about what to look for, let’s move into our bassinet review. We put our top and budgets picks first so, even if you’re in a hurry, you’ll still get a good idea about the range that’s available. Stick around and read about all of our products if you can. Every model is different and you never know which one will be the one for you. Alright, are you ready? Let’s go! Our pick for best baby bassinet is the BABYBJORN Cradle. 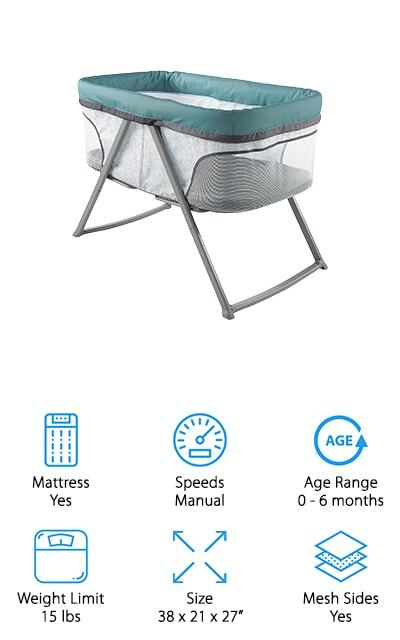 Because of its low height and transparent mesh sides, it’s designed so you can easily see your baby whether sitting, standing, or laying down in bed. Plus, there are no bars so there’s nothing to obstruct your view of your sleeping little one. 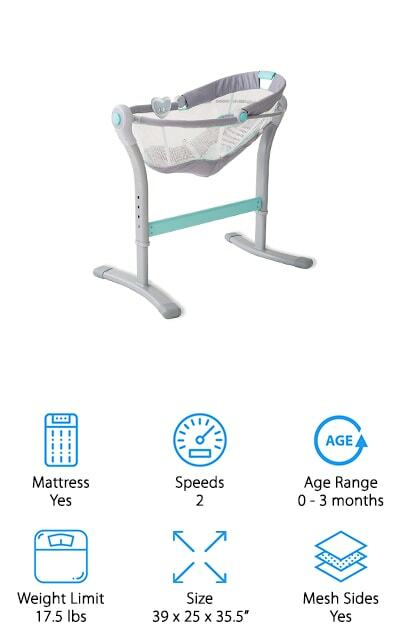 That’s not all, the mesh lets fresh air flow into the bassinet to help keep your baby comfortable and sleeping soundly. At only 13 pounds, it’s easy to move around the house and the non-slip foot grips support it without damaging your floors. Gently rock this cradle on your own or allow your baby’s subtle movements to move it back and forth. This cradle is designed for infants up to six months old. The SwaddleMe By Your Bed Sleeping is our budget pick for rocking bassinet. It allows your little one to sleep right next to you and is a good alternative to bed sharing. Why do we say that? Not only can you adjust the height, the legs are designed to slide under your bed so the baby can sleep right next to you. This bassinet has a 2-position incline that can help your baby get more comfortable. If they’re congested or suffering from reflux, a high angle can actually help them sleep more soundly. You can easily rock the bassinet side to side plus there are two different vibration settings to help soothe your baby to sleep. One more thing, the infant insert is machine washable. If you’re looking for something that can do double duty, check out the Graco DreamGlider Sleeper. It’s not only an awesome cradle, it’s a swing, too. The seat glides back and forth and you can choose from six different speed settings. When it’s time to sleep, the seat can be lowered quickly and easily in a gentle manner that won’t disturb the baby. 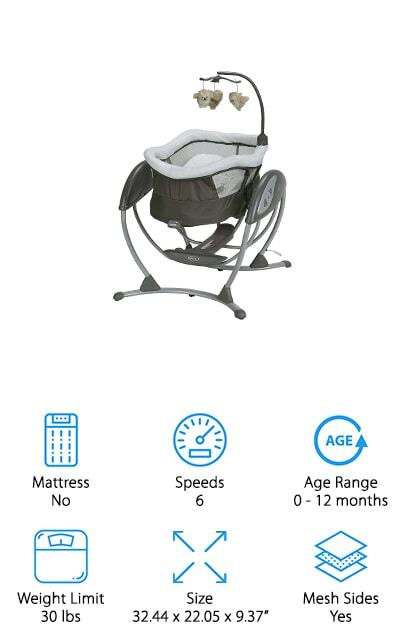 There are also two different vibration settings to choose from, giving you even more ways to keep your little one calm. Plus, it also has a small mobile with soft plush toys that provide visual stimulation and plays 10 different songs and 5 nature sounds to entertain or lull your baby to sleep. One more thing, the owl theme and color scheme are gender neutral. Next up is the Dream on Me Portable Bassinet. 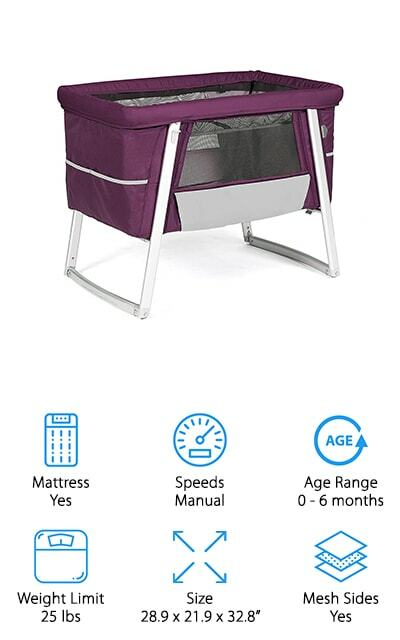 This one is a pretty generous size and gives your little one a lot of room to move around. The lightweight aluminum frame and hooded locking wheels make it really easy to move around the house. Then, when it’s time to sleep, the wheels rotate upward to transform it into a rocking cradle. With the wheels out of the way, the rails touch the floor so you can manually move it back and forth. One of the best things about this bassinet is the large basket located under the cradle itself. Stock it with diapers, wipes, toys, and pacifiers and you’ll have everything you need no matter what room you and the baby are in. Another great option if you’re looking for a bassinet that’s portable is the Delta Children Gliding Bassinet. It has a durable steel frame and the fabric of the included mattress pad and sheet is all machine washable. 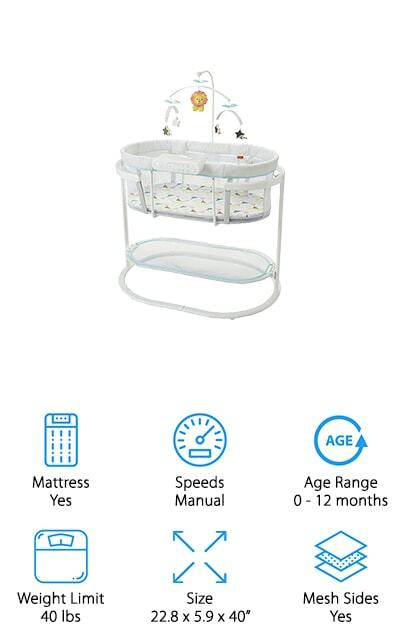 Not only does this bassinet have calming, side to side movement, it also features a night light, soothing music, and a small mobile for visual stimulation. Plus, the canopy can be adjusted to keep light out when your baby’s trying to sleep or you can remove it all together. There’s also a large double storage basket underneath where you can keep a supply of essentials so they’re handy anywhere you go. The neutral color palette is perfect for a boy or girl and it matches the decor of any room. 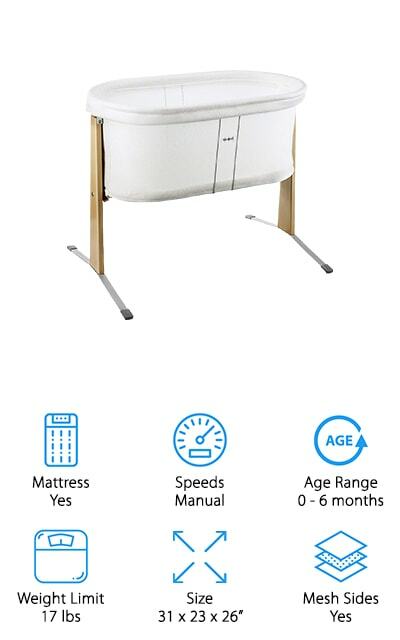 The Fisher-Price Soothing Motions Bassinet is a good choice for a bedside bassinet. 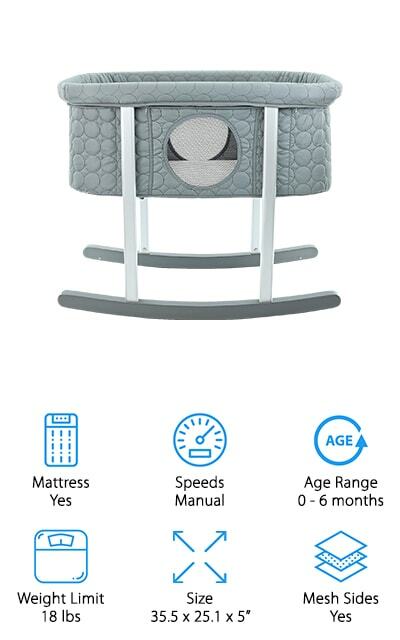 The height is perfect for putting next to your bed and the see-through mesh allows you to easily check on your baby from any angle without disturbing them. 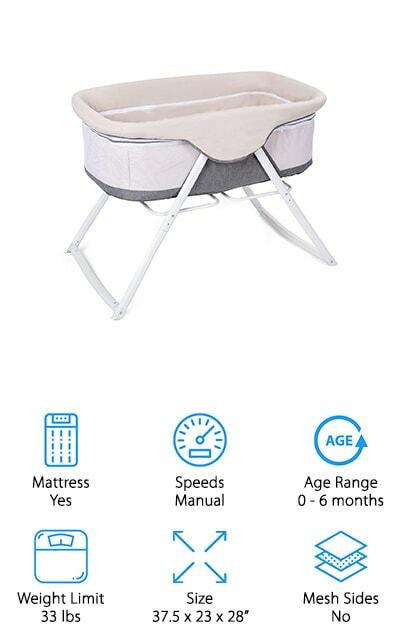 You can easily reach over and rock the bassinet yourself or let the calming vibrations of the bassinet do the calming. 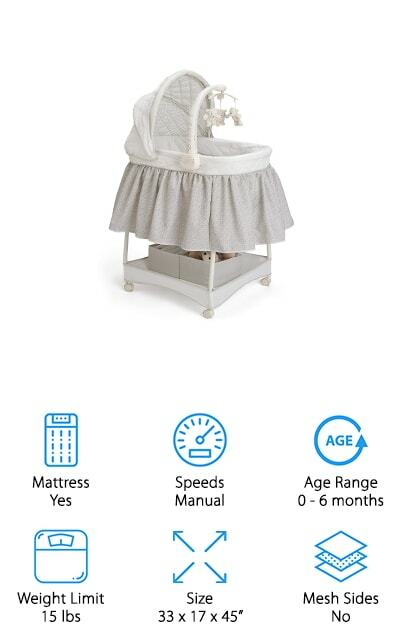 This bassinet is loaded with features for your little one. In addition to vibrating, it also plays soothing songs and sounds. Plus, there’s a small mobile overhead as well as light features that project stars onto the walls and ceiling. The projector is actually removable so you can continue to use it on a table top long after your baby has outgrown their bassinet. The best bassinet the looks modern and has a lot of style is the Green Frog Bassinet Cradle. This is a baby item you won’t mind having in any room of your house. The low height and transparent mesh side window help you keep an eye on your baby from just about anywhere in the room. This bassinet is lightweight and easy to transport to any room in the house thanks to the custom designed wheels. Plus, large rockers allow you to manually move the cradle back and forth when it’s time to sleep. It includes a premium mattress as well as a washable cotton cover sheet. And get this, everything from the fabric covering the bassinet to the sheet cover is completely machine washable. Next up in our list for best baby bassinet for sale is the Ingenuity FoldAway Rocking Bassinet. While a lot of our picks are portable, this one is a great choice if you want to travel a little farther than the next room. It has easy one step folding so set up and take down take mere seconds and it’s easy to store or transport. Breathable mesh sides let you see the baby from anywhere in the room. The legs can be set in stationary mode if you don’t want them to move but a simple twist and they’re ready to rock. You can easily move the bassinet side to side when bedtime comes or for a fussy middle-of-the-night wake up. It’s the perfect height to keep right next to your bed. Out next pick for best baby bassinet is the BabyHome Air Bassinet. One of the cool things about this bassinet is the legs have three interchangeable positions. Use the wheels to easily move it from room to room or set it to stationary to eliminate any movement. Of course, you can also change it to rocking position when it’s time to lull your little one to sleep. The sides feature a large mesh window so you can see your baby from anywhere in the room. Get this, there’s also a flap with a magnet closure that you can use to cover the window if you want to give your little one more privacy. One more thing, the fabric is removable and you can toss it right in the washing machine. Last up is the Costzon Baby Bassinet. You can use this as a stationary bassinet as well as a rocker by simply turning feet. The sides of this bassinet are see-through mesh which lets you keep an eye on your baby wherever you are. It also has a microfiber cover that zips over the mesh. It’s actually filled with sponge that’s about an inch thick to add extra warmth and keep your baby comfortable during the colder months. This bassinet is lightweight and folds down to a compact, easy to transport size. Also included is an Oxford carry bag which for easy travel beyond the next room. The light aluminum frame is durable and easy to carry. Overall, this is a stylish, safe, and cozy option for your sleeping baby.